North District races were a mystery to me, when I started at Aberdeen University in 1966, but Aberdeen AAC did travel to them frequently, possibly because the club’s irascible guru, Alastair Wood, had been born in Elgin. In late September 1967 I vaguely remember participating in the Nairn to Inverness Road Relay. This attracted four man teams, with each individual racing a stage of four miles along the fairly busy main road, past stretches of lonesome farmland, to the Highland capital. Unfamiliar runners from Elgin AC, Inverness Harriers and Forres Harriers tried and failed to outpace Aberdonians. What happened was that Aberdeen AAC had little difficulty in establishing a good lead, probably due to Alastair Wood and Steve Taylor, but they had one or two younger, slower runners. My team, Aberdeen University, were second but the leader was out of sight when I took over for the last leg. The weather had steadily worsened, with a strong headwind and drenching downpour, but I just bashed on dourly. To my amazement, just into Inverness, I noticed the inexperienced Aberdeen AAC runner (a youthful 880 yard specialist) sheltering in a shop doorway. Jolly good, I thought, unsympathetically and shortly afterwards crossed the finish line to obtain a surprise team victory. Then it was time for free tea and scones in a restaurant. On 21st September 1968, I finished a less-than-meritorious second on the first stage of the Nairn to Inverness. Unfortunately the first man home was Alastair Wood, and I endured the experience of being outclassed totally. The three-mile straight to the handover point took an eternity as Alastair disappeared inexorably from view. He finished a humiliating 74 seconds ahead! AU finished third team to Aberdeen and Forres. By 1969, however, Aberdeen University had a pretty good team – we went on to finish ninth in the 1970 E to G, and we were stronger in four-man events. Running into a strong headwind, I was only four seconds down on Joe Clare (AAAC) but ‘miles’ in front of the third team. Charlie Macaulay established a good lead for us; Don Ritchie only lost a minute to Woodie; and Robin Orr held on to secure a rare victory over the city club. On 17th September 1970 we retained our title. ‘Gaudie’, the AU newspaper, reports: “Varsity defeated Aberdeen AAC, Forres Harriers, Lochaber AC and Inverness Harriers teams. Colin Youngson, Charlie Macaulay, Donald Mackintosh and Donald Ritchie ran well in unhelpful conditions to record a time of 1 hour 20 minutes and 30 seconds, which is only 17 seconds outside the record.” This time, Ally Wood was only twelve seconds in front of me after the first stage; Charlie shot into the lead; and the two Donalds moved well clear of the opposition. The Nairn to Inverness Relay was great fun and good training for more challenging team events in the Central Belt. The start was on top of a short but steep hill on the edge of Inverness, followed by the long straight main route to Forres, running on the right hand side of the road. The only advice was that, when you passed under the railway bridge at Nairn, there were ten miles to go to the finish in the Games arena in Grant Park, Forres. A newspaper clipping shows Ally Wood striding off rapidly, followed only by Don Ritchie. Since it was a hot day, they were both sporting jaunty knotted white hankies, scout neckerchief fashion. There were only 14 intrepid starters. My diary notes: “Lots of food and drink before. Watched Wood shoot off while I ran steadily with the second pack. After 10 miles, I broke away. Passed several, feeling good, then worse. However saw the foolhardy DR ‘dying’ ahead, so passed him at 18 (he dropped out at 23). Did the rest on my own – hard but not competitive. Sponges at every stop and two small drinks of water. Okay state, considering, at the end. Sore thighs and feet but no blisters. Might have caught Hughie Mitchell if I had pushed it.” 1st AJW (2.27.44), 2nd Hugh Mitchell (Shettleston) 2.38, 3rd Colin Youngson 2.41.13. Third prize was a pedestal ashtray – just what an improving young runner might have desired, not. After a holiday, the next race I contested was another ‘you have to be 21 at least’ event – the gruelling Ben Nevis race – in those days, we used to run everything! Alastair Wood had made major headlines back in 1966 when he ran a fantastic British and European Record marathon (2.13.45) in this event. He had peaked brilliantly by the unusual method of running as many as 60 x 220 yard strides! On the 9th of July he “was full of energy, his knees coming up of their own accord!” There may possibly have been a following breeze, but there is no doubt that he was capable of such a time, which was later ratified. It was a day on which Alastair felt he could “run forever” and local rumour has it that he claimed to be “the fastest white man in the world” (behind an African( Abebe Bikila), a Japanese (Morio Shigematsu) and a Mongolian Russian)! 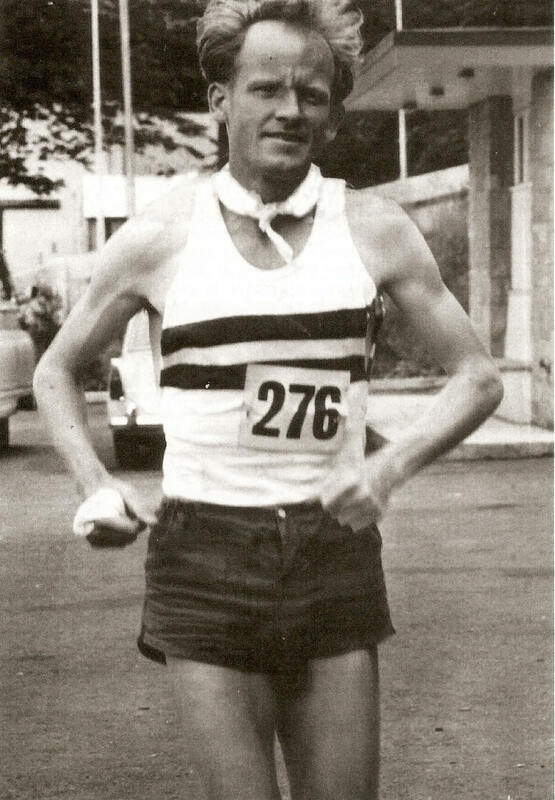 Alastair Wood won the Inverness to Forres Marathon again in 1967, so 1969 was his third victory. In 1970, Alastair achieved a fourth victory and apparently broke his own course record, by winning in 2.13.44, no less than 22 minutes in front of the second-placed Duncan Davidson of Forres Harriers. However this time the distance was a little short, due to a change of start place. On Saturday 6th July 1974, just two weeks after finishing third in the Scottish marathon championship, representing ESH, I turned up for what turned out to be the final Inverness to Forres. I have a copy of the race instructions as well as the precise locations of the ‘refreshment stalls’. The race started now “on Longman Road at 1 p.m. sharp, directly opposite Lamp Standard on left of entrance to Brown Wooden Building, midway between Auto Sales and Ferries Garage. Runners must keep on the left side of roadway.” One official was instructed to “run and open the Canvas Gate near to the Cricket Pavilion so that runners are not hindered in getting into the Park”. However my pot-hunting attempt was doomed. At the start I met the redoubtable Sandy Keith, a training partner and major rival from Edinburgh AC. At the Scottish marathon, he had led for some time then ‘blown up’ a little to finish fourth, four minutes behind me. However his powers of recovery were far greater. I threw in several fartlek bursts during the first ten miles of the Forres race, failed to shake Sandy, and then ‘gave up’ and watched him stride away out of sight. He won in 2.26, whereas I plodded in second in 2.33.44. I have the finisher’s certificate, signed by Forres Harriers official Sandy Brander, who did a lot for North Athletics, along with Tom Mackenzie, a cheerful, charismatic Inverness stalwart. On Saturday the first of October 1970, just a fortnight after winning the Nairn to Inverness Relay, AU were first team in the Alves to Forres Road Race, organised by Forres Harriers, over 6 and a quarter miles. Alastair Wood was first in 30.17, with me second (31.06) and Don Ritchie third (31.10). Our team was completed by Charlie Macaulay (5th) and Donald Macintosh (7th). We defeated teams from Forres, Aberdeen and Lochaber. Alves (and forty years later I learned that the ‘l’ is silent) is a hamlet situated at the bottom of a hill. There was a stiff headwind. Consequently the wily Wood left the start like a sprinter, streaked up the tough little rise over the railway bridge, and made sure that no one was capable of sheltering behind him. The route follows the main road north, past forest and farmland, lightly undulating. To my lasting shame, I ‘sat’ behind my team-mate Don Ritchie the whole way. We were very close rivals at the time: he was stronger but I was slightly faster on a firm surface. Lacking the stamina and confidence to share the pace, I simply waited until I could see the finish line and surged away before turning round and apologising to my friend, who was philosophical about the sneaky tactics. On checking a training diary, I see to my surprise that I ran the Alves to Forres again on Sunday the 4th of October 1987. Another headwind. The winner was Ross Arbuckle of Keith (30.07) from Chris Armstrong and Bruce Chinnick of Forres Harriers. I was fourth in 30.52, a decent run for someone three weeks short of his 40th birthday. As Charlie Bannerman has reported, the A to F inevitably had to be taken off the main road and its next variation was a six mile race from the village of Dallas to the town of Forres. On Sunday 1st October 1989 I finished 1st Vet and second overall (32.12), well behind Graham Laing (30.43). There was a dreadful downhill start and then it was undulating into a headwind. Next version featured a course involving an out and back to Grant Park, Forres plus a testing hilly loop to the left of Rafford village. On Sunday 7th October 1990 I found myself duelling with my young friend Ian Williamson (Shetland and Aberdeen AAC). Even a final ‘sprint’ failed to separate us and we finished first equal. Unfortunately that effort caused me to rip a muscle in my backside, which took two months to heal properly – so I never did that race again! However in 2010 I did manage 1st M60 in the nearby Dyke 10k, which is, according to Mr Bannerman, the current incarnation of the Alves to Forres. I look forward to plodding round the Forres Highland Games 10k as well, to ensure that I have taken part in all possible variations of the old-style A to F (and the shortened Inverness to Forres marathon). Back in the 1960s and 1970s, with the Alves to Forres, the Inverness to Forres marathon and the Nairn to Inverness Relay plus the Inverness to Drumnadrochit Road Race, it was possible to have raced on almost 50 continuous miles of main road! My first attempt at the latter was on the 29th of August 1970. The event was part of the Glenurquhart Highland Gathering and the distance was listed as 15 and a half miles. The race started in a side street near the river, and then continued out of the city, over the Caledonian Canal and through thick woods to the beginning of Loch Ness. After that it was fairly hilly and ‘Nessie-spotting’ was a popular distraction. Eventually the course swooped down past the Drumnadrochit Hotel, turned left all the way through the village, and then right and round the Games grass track to the finish. Only eleven runners turned up that day, and no ‘stars’, so I won in the modest time of 1.27.04 from Hamish Scott of Forres (and later Perth) and my AU mates Charlie Macaulay and Don Ritchie. The Mackay Challenge Cup was presented to the pleased but surprised victor. Once I returned to live near Aberdeen in 1981, I ran the race three times in succession. On Saturday 29th August 1981 I ended up a well-beaten fourth in 1.19.43, suffering a warm day when the constant undulations felt tough. The winner was that talented young maverick Willie Sheridan (Victoria Park 1.17.50), from marathon star Fraser Clyne (Aberdeen AAC 1.17.58) and gritty Graham Milne (AAAC 1.18.16). One year later, on a cold, blustery day into a headwind, I found another youthful star too much for me: Graham Laing (AAAC) won in 1.17.48, with me struggling for pace in second (1.19.37) in front of Ian Moncur (Forres) and George Reynolds and Peter Wilson of AAAC. On Saturday 27th August 1983, I won the race again, in rather unusual circumstances. Anglo-Scot Dave Clark (arguably Scotland’s finest veteran marathon runner), who had been educated at Aberdeen University, was enjoying a holiday up north. At seven miles the two of us drew away from Ian Moncur and Paul Kenney (Inverness). I tried very hard to ‘dump’ my old acquaintance after that by surging on the uphills, but he kept up with disconcerting ease. Eventually, my diary notes: “I shot away downhill into Drumnadrochit, like a scared rabbit to the finish, in 1.18.35, less than a minute off the record.” I was somewhat chagrined to learn afterwards that Dave, who had rolled in fourteen seconds behind, had been sure that we were going to run in together! 85 athletes took part that day. In the last years of the Inverness to Drumnadrochit, Graham Laing, who had moved to Inverness, won nearly every one. It was a good, scenic race with a considerable tradition and excellent training for Autumn city marathons like Aberdeen or Glasgow.